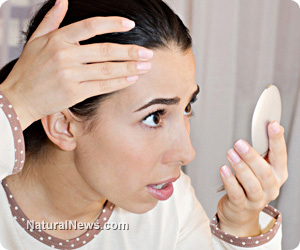 (NaturalNews) Days ago it was announced that European researchers had discovered a breakthrough cure for grey and thinning hair: A topical application of a sun-activated compound called PC-KUS (a modified pseudocatalase). However, the researchers may be a few hundred years late with their discovery since onion juice has been used as a remedy for thin and greying hair for ages. What the researchers found was that grey hair is primarily caused by a buildup of hydrogen peroxide at the root of hair follicles and that this was due in great part to a reduction in the natural antioxidant compound catalase. In addition to helping cleanse the scalp and follicles, onion juice also promotes the production of catalase. Catalase prevents grey hair as well as promoted thicker hair follicles. The researchers "new" breakthrough appears to be the rediscovery of a remedy for grey hair and baldness that herbalists have known for centuries: Onion juice. Hundreds of years ago, famed herbalist John Gerard (1545- 1612) wrote: "the juyce of onions annointed upon a bald head in the sun bringeth the hair againe very speedily." Today, many herbalists recommend onion juice either singly or in combination with other natural items as a remedy for grey and thinning hair. In 2009, a similar breakthrough for grey hair was reported which also found that hydrogen peroxide buildup was a culprit and that the compound catalase could reverse grey hair. That research was conducted by Bradford University in the UK. The oriental remedy fo-ti has a long history of being used for grey hair. Fo-ti is also called he shou wu, which translates to "black-haired Mr. He" or "Mr. He's black hair". Black Strap molasses has worked well for many people for restoration of color, but it may take some time (as is true with other remedies as well). Pine needle tea is another remedy which has been used to help with greying hair. Many have reported that moringa leaf and moringa root extracts have restored hair color as well as helped with thinning hair. As is true for the entire body, good nutrition is essential for healthy hair. The best diet for hair health is a wholesome diet which is rich in silica, B-vitamins, omega-3s, protein, calcium and iron. Other important nutrients include antioxidants, trace minerals and vitamin A. "See more articles by Tony Isaacs"
Tony Isaacs, is a natural health author, advocate and researcher who hosts The Best Years in Life website for those who wish to avoid prescription drugs and mainstream managed illness and live longer, healthier and happier lives naturally. Mr. Isaacs is the author of books and articles about natural health, longevity and beating cancer including "Cancer's Natural Enemy" and is working on a major book project due to be published later this year. Mr. Isaacs also hosts the Yahoo Oleandersoup group of over 3000 members and the The Best Years in Life Radio Show" on BlogTalk Radio.